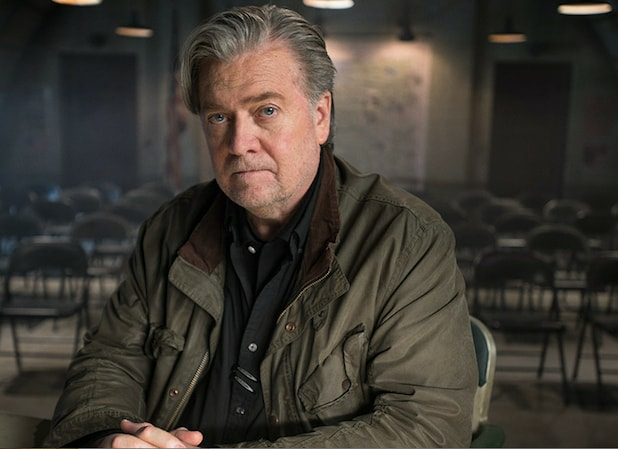 Before you start whingeing on about why the acclaimed documentarian Errol Morris decided to give the evil Steve Bannon a soapbox as the subject of Morris’ new documentary, hold on. “American Dharma” is a great example of why more speech is better, as a rule. And why letting even demagogues – and sometimes especially demagogues – explain themselves and face critical questioning is a revealing process. In this instance, Bannon exposes himself in the film as a man with nothing much to offer in the way of ideology. He’s got confidence in spades and cynicism to spare, all in the pursuit of destroying the establishment and its institutions. But under even the most gentle questioning from Morris he is revealed to have no plan as to what lies beyond his desired destruction, currently on display in the Trump administration. His “populism ” – supposedly about helping the working man, the forgotten American – isn’t there. He dismisses the enthusiasm of white nationalists on his behalf as unimportant. In the film, Morris says: “Do you just want to destroy everything, clear the decks, before you can usher in the new?” Bannon says he does: “We have to clear out the underbrush.” What lies beneath the underbrush – what shining new society, with no government regulations, jobs in abundance and no more conflicts abroad – is left unsaid. What is there is a twisted allegiance to Lucifer (the real one) and a visible delight in Bannon’s ability to ignore ethics and morality to upend the established order. It all makes sense to him. It didn’t to me. Morris, the maker of such landmark documentaries as “Thin Blue Line,” “The Fog of War” about Robert MacNamara and “The Unknown Known” about Donald Rumsfeld, is in some ways a perfect foil for understanding Steve Bannon. He is calm, avuncular and sincere – and also really slow in his pace. That makes him seem like he’s some kind of shrink letting Bannon plumb his own depths. I talked to Morris this week at the Toronto Film Festival and he agreed that the film exposed Bannon for what he is. He went on: “There’s an insanity afoot, an amoral world where people find various justifications for abandoning ethics altogether, and charting some kind of strange, crazy course where anything and everything goes. It’s curious. I must have met three different people in the past week who worked closely with Bannon in Hollywood. “He always needed a paycheck,” said one producer, who worked with him and didn’t want to be named. He was always reading, and was desperate to be doing things that mattered. All of them said it was every bit as outrageous an outcome as Trump winning to have Bannon as the policy consigliere at the White House. Bannon craves the approval of Morris even as the documentarian calls him “crazy” to his face. And while the ideologue has managed to shave and put on a decent outfit – no longer looking like the unwashed, unhinged raver of his final days at the White House – he makes no more sense than he did at that time. Check out my discussion with Morris in the video above.